Challenge Wanaka, what can I say… it’s an absolutely amazing place and race. Lake Wanaka is found about a one hour drive from Queenstown, over the Crown Range in the South Island of New Zealand. It’s a small town that has a huge heart and voice. It’s one of my favourite places in the world and one of my favourite races. From racing for the first time in 2015, I just fell in love with the place. There’s an air of tranquillity and calmness and it’s like all the stress in life just lifts off and floats off into the sky as you cross the Crown Range and descend down into Wanaka, getting that first glimpse of the lake. From that first year, as a new pro and newcomer to the sport, I was made to feel so special. I was welcomed like they had known me for years, and was made to feel incredible valued and special for being there. I know as well that it’s not just the Professionals that are made to feel like this, everyone who comes to Wanaka has this feeling and appreciation. Challenge Wanaka, is now a firm favourite on my race calendar every year. As well as this welcome, I’m going to give you a few more reasons (there are a lot more than I can list here) why you too should put Challenge Wanaka on your bucket list and come and race and there’s still plenty of time to enter! In all the races I’ve done around the world, I don’t think there is a course that matches Wanaka in beauty across all three disciplines of the swim, bike and run. 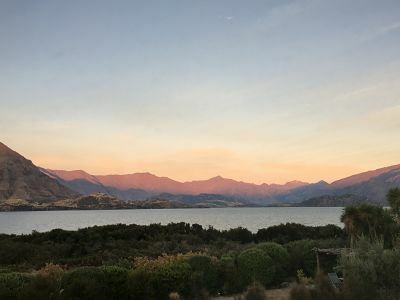 From the sun hitting the top of the surrounding mountains on race morning, in an orange glow, to the bike course out to Glendhu Bay and Lake Hawea, to the run along the Outlet Track, it’s just breath taking. I know, I know, so many people talk about beautiful courses and stunning locations… but Wanaka, I’ll bet my house (if I had one) beats them all! It’s not a coincidence it’s been voted the most scenic triathlon in the World! It’s stunningly brutal! An honest and challenging course! Now for those seeking personal best times, this is probably not for you, but I urge you to think why you do triathlon? Why do you partake in this lifestyle choice, for it is a lifestyle? Wanaka is not going to give you that super-fast time, but what it will give you is a true sense of accomplishment and achievement. It’s a true triathlon which will test you in every element, but as I mentioned in point one, you do so in a simple stunning environment. The swim in Lake Wanaka is surrounded by the mountains. Many people are put off by the temperature of the water, but I think this is blown out of proportion. The temperature can be fresh, but since the race moved to the end of February, I don’t think it’s been too cold, and I’ve never really found it that bad. With a wetsuit you are fine, so don’t listen to the worrywarts and people trying to warn you off. However, it’s not Caribbean temperatures either if that’s what you are looking for. The bike will take you around to Glendhu Bay and then back through the buzz of town and out to Lake Hawea. Along Hawea Flats across the Red Bridge and back up to the airport and town. The road surface is not fast, there may be some wind, and the course rolls along up and down, but you simple can’t stop smiling as you ride. The run course is unique being predominantly on a trail that takes you along the water front and around the lake, veering off down the Outlet Track. On a hot day, you’ll be enticed to take a detour and dive into the crystal waters, encouraged by the people tubing down the Clutha River. Gunn Road greets you at the end of the track. It’s nothing to laugh about and I haven’t found any other courses with a hill like this on the run. But the crowd will carry you up there and then all the way back down to town! Check out my videos of the swim and run course. Become New Zealand’s National Champion! This year Challenge Wanaka is also the New Zealand National Middle Distance Championships. It’s a perfect course for a Championships race, as it has the challenge mentioned in #2, but has the festival atmosphere deserving of a Championship race. It will act as the qualifier for the ITU Long Course World Championships in Denmark later in 2018. AND the top six finishers in each age group gain automatic qualification to The Challenge Family Championship, in Samorin, Slovakia, June 2018. Spoilt for Choice for Race Options! Don’t despair if you don’t want to compete in NZ National Champs, there are plenty of other options for races to enter. What is also special about Challenge Wanaka is that there are so many options to race it really is welcoming to all levels, and all abilities. You can enter the half distance or full distance triathlon, individually, but you can also enter both as a team. This year there’s an AquaBike taking place as well. This is a 3km swim and 120km bike, and will be a qualifier for the ITU Multisport World Championships in Denmark in 2018. What’s even better is that the first eligible* overall male and female across the line in the AquaBike will win a voucher worth $2500NZD towards their return flights from Auckland to Denmark, plus eight nights of accommodation! Not only that, but all podium place getters (first, second and third) in each age group, will win half the cost of eight nights of accommodation for the Championships in Denmark!! Wanaka as a place is just an amazing community and a hive of activities in the town and surrounding countryside! In fact, you may want to come here and not even race there’s so much to do. Whether this is just enjoying the restaurants and cafes in town, or venturing up one of the many hikes and tramps. Make sure you check out some of the amazing treks. Roys Peak – panoramic views from the 1578m summit including Lake Wanaka and Mount Aspiring. Rob Roy Glacier – spectacular alpine scenery and views of the Rob Roy Glacier. Mount Iron – a much easier short walk which still provides 360 degree panoramic views. Perhaps head up for a stunning sunrise! SUP over to Ruby Island – take a paddle board out to explore Lake Wanaka, The Clutha River, Roys Bay and Ruby Island, take a picnic and enjoy being on the island in the middle of the lake. Further afield you have the Blue Pools, and plenty of options for climbing some of the amazing cliffs and rock faces, as well as the opportunity for the ultimate thrill in sky diving over Wanaka. And if you exhaust all the options in Wanaka, well then Queenstown isn’t too far away with another huge playground of adventure! As I travel the world training and racing, one thing I love is coffee and exploring the local cafes. I enjoy trying to find the cafes that are where the locals hang out, or ones slightly off the tourist track. Wanaka has a whole host of cafes, restaurants and bars and caters for all types of food preferences. My favourite places though, and the places I’ll definitely make sure I go (at least once, or twice, ok a lot more) whilst I’m there are Federal Dinner or perhaps Urban Grind for coffees. You’ll find me grabbing a healthy feed from Big Fig and post race enjoying a wine or two and the amazing food at Kika. I also love grabbing a wood fire pizza from Francesca’s Pizza Truck! An Amazing Community and an Army of Incredible Volunteers! You’re in Central Otago countryside, some of the best of New Zealand’s and the world’s wine is produced here. In fact, my favourite wine globally is produced at a vineyard not too far from Wanaka, Mount Difficulty. Even closer to Wanaka though and right on the shores of lake is Rippon vineyard and a magic spot to enjoy Wanaka and all it has to offer post race. Whilst Challenge Wanaka is the New Zealand Champs, and has races that qualify you for The Challenge Championships, and the ITU Long Course World Championships, it’s also one of the most family friendly festivals there is! Not only is Wanaka a safe and friendly place with an incredibly strong community feel, everything about the race is centrally located and easy to get around. But there is so much going on for all the family. If it’s racing the kids want, then there’s the Junior Challenge (one of the biggest kids triathlon events globally) and so many other activities (including Puzzling World, which is also great for adults too). Challenge Wanaka also hosts the Otago Secondary Schools Triathlon Championships. However, as I’m not quite a kid anymore, even though I can act like one very well at times, I called upon my trusty side kick Lilliana Murray-Orr to give her top three favourite things from an 11 year old perspective about Wanaka. It’s no surprise from an 11 year old what was at the top spot! Black Peak Ice Cream! – especially the lemon sorbet or salted caramel ice cream. Jumping off the wharf into the Lake or off the pontoon. I also asked my little bud what she would change about the race if she was race director… so watch out for these interesting course additions in the future! The race start would begin with an obstacle course and big slide into the water to start the swim! The run would include running across a big stream, where you had to run over big bouncy balls! It would be rude to not talk about top things in Wanaka, without including The Wanaka Tree! The most photographed tree in New Zealand, and the perfect way to move the body post race by a gorgeous swim out to the tree. Alternatively, a stroll around the Lake front will take you right past That Wanaka Tree and perfect for photographs. However, with no signs directing you to the solitary tree, it’s not too bothered by tourists!